Oprah's spiritual adviser joins a crowded 2020 field. 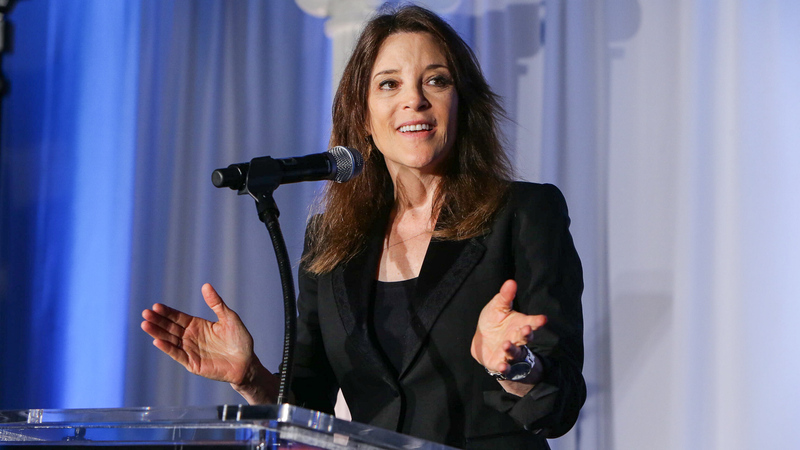 New-age spiritual guru Marianne Williamson is running for president. Williamson made her fortune as a best-selling author. The 66-year-old has never held a government-elected position. Perhaps the next best thing to Oprah Winfrey running for president is her spiritual adviser and friend, Marianne Williamson, running for president. It was with Williamson’s announcement earlier in January that she joined the ever-growing field of Democrats all too eager to defeat President Donald Trump in the 2020 presidential race. As of Feb. 5, there are ten confirmed Democratic hopefuls with at least a dozen more candidates speculated to join the field, the New York Times reported. Meanwhile, not a single Republican has stepped forward to challenge the incumbent Trump. From sales of her books, lecture earnings and fees from celebrity clients including Katy Perry, Nicole Richie and Laura Dern, Williamson’s fortune is estimated to be around $1.1 million. Platitudes aside, chief among Williamson’s campaign issues is a proposed $100 billion in slave reparations, with $10 billion to be distributed annually over a decade for economic and education projects. But don’t think that Williamson’s bid is a lark — the celebrity made an unsuccessful play for Congress in 2014 and has spoken at length about her displeasure for Trump. The Houston, Texas, native is the daughter of an immigration lawyer and a stay-at-home mom. Despite her seemingly nuclear upbringing, Williamson’s 20s could be characterized as wayward and adrift: She spent just two years at Pomona College before dropping out and moving to a New Mexico commune. While crisscrossing the country, Williamson developed dependencies on “food, drugs, people, or whatever else I could find to distract me from myself,” she later wrote in her book “A Return to Love.” Oprah promoted the title through her book club. Settling in Los Angeles, Williamson began studying new-age Christianity texts and teaching spirituality in 1983. Since gaining notoriety, she’s famously rebuked Western medicine while maintaining a firm commitment to social justice and non-profit activism. Williamson was briefly married and has one daughter, India Emma, who was born in 1990. Check out fellow presidential candidate Kamala Harris’ net worth. El Chapo was found guilty on 10 criminal counts on Feb. 12. Don’t miss these 50 underrated vacation spots.